A delicious blend of beef, pork, rutabaga, potato, onion and carrot, seasoned to perfection and nestled in a golden crust. Small 12-ounce pasties or large 16-ounce pasties available every day. Mini-pasties are available by special order. Chicken, broccoli, potatoes, onion, carrots and cheese mixed with our exclusive blend of seasonings all wrapped up in a flaky crust. This 12-ounce pasty packs the famous Roy's flavor! An award winning non-traditional pasty filled with delicious roasted turkey, potatoes, savory gravy, dressing and cranberries! Crafted to satisfy taste buds everywhere! 12-ounce pasty. The most important pasty of the day! Our crisp golden pasty crust is wrapped around eggs, breakfast sausage, potato, cheese, onion and the best seasoning on this side of the universe! 10-ounce pasty. Danish dough, eggs, cheese, red and green peppers, onion and ham makes this the perfect start to your day. Not a fan of meat? This is the perfect answer for veggie lovers. Packed with potatoes, rutabaga, carrots and onion. 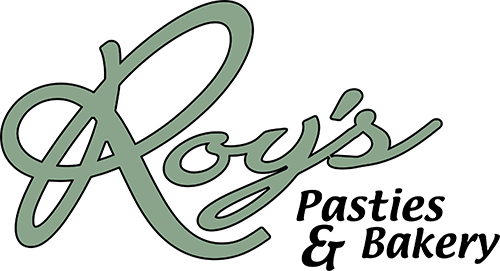 Baked to perfection in Roy's signature crust and packed with mouth-watering flavor! 16-ounce pasty. Bacon Cheeseburger------Made Wednesday and Thursday! Our variety will capture the imagination of those who love their cheeseburgers! Made in our famous crust with ground Angus beef, our burger comes with cheddar cheese, potato and onion with a generous helping of bacon. We serve it with dill relish and yellow mustard on the side. Enjoy! 12-ounce pasty. Pizza Pasty------Made Wednesday and Friday! Pepperoni, sausage, mozzarella and cheddar cheeses, potatoes, onions and pizza sauce in a delicious crust packed with all the sensational pizza flavor your heart desires! 16-ounce pasty. Pasty with a Kick!-------Made Tuesday and Wednesday! Our new take on the traditional pasty for those who like a little heat. Our traditional pasty, made without the rutabaga, add in some jalapenos and hot sauce, and you've got a pasty with zest. Rated mild on hotness scale. 12-ounce pasty. *Sandwiches served with your choice of our homemade chips, coleslaw, or Greek pasta salad. Substitute Gluten-Free Bread For - $2.00 More! Shaved, slow-roasted beef piled high and garnished with cream cheese, onion, lettuce and sprouts on your choice of bread. Slow-roasted Italian beef dipped in au jus sauce with giardiniera peppers, provolone cheese, lettuce and tomato on Italian bread. Cheddar and provolone cheeses, tomato, onion, avocado, lettuce and sprouts topped with our tasty dijonnaise on Roy's ten-grain bread. Savory shaved smoked turkey breast served with cheddar or provolone cheese, lettuce, tomato and onion on your choice of bread. Our own flavorful house-recipe of oven-roasted chicken, onion, celery, dried sweetened cranberries, and spices make up our delicious chicken salad. It's garnished with lettuce and tomato on your choice of bread. Grilled hot seasoned beef and lamb served with a creamy cucumber sauce, chopped onions, and diced tomatoes on fluffy pita bread. Crispy bacon, lettuce, tomato and mayonnaise on your choice of toasted bread. A true American classic! The U.P. twist on the philly. Grilled onions and our roast beef oozing with melted provolone and cream cheese served on Italian bread. Perfect! Hummus, cream cheese, avocado, lettuce, tomato and sprouts served on Roy's ten-grain bread. Our yummy ten-grain bread is toasted up with sliced cheddar cheese, a generous serving of turkey, avocado, sprouts, lettuce and tomato with our homemade dijonnaise. Roy's favorite! Grilled ham, melted Havarti cheese, grilled onions, cream cheese, dijonnaise, and tomato on oat and honey bread. Spinach leaves, black olives, tomato, red onions, feta cheese, banana peppers and vinaigrette. Start with our Italian bread; add our turkey, three slices of bacon, cream cheese, lettuce and tomato to create our house special. Baby iceberg, our house chicken salad and balsamic glaze reduction, topped with chopped tomatoes. Sliced turkey, cranberry citrus herb cheese spread, sliced provolone cheese, and fresh spinach stacked on locally grown whole wheat bread. Our whole grain flat-bread topped with roasted red pepper hummus, marinated grilled chicken, fresh spinach, sliced red onion, sliced olives, and tri-colored peppers. Our fresh chicken salad, sliced apples, cranberries, chopped lettuce and feta crumbles finished with an apple cider vinaigrette in a honey wheat tortilla. Ham, bistro deli sauce, smoked gouda cheese served on flat-top toasted sourdough bread. Our tasty twist on the classic deli sandwich! Available mornings! Medium-hard egg, ham, Havarti cheese, cream cheese, leaf spinach on toasted Italian bread. Flat top grilled peanut butter and strawberry or grape jelly on your choice of bread. A kids’ fave! Your choice of bread, buttered and flat top grilled with sliced cheddar or provolone cheeses. Whitefish Chowder---Friday and Saturday Only! Matt's Chili----Friday and Saturday Only! Oat & Honey, Country White, Whole Wheat, Caraway Rye, Gluten Free Bread, Italian, Roy's Ten-Grain, Nisu, Brioche. Cranberry Walnut, Jalapeño Cheddar, Asiago Herb & Garlic, Marble Rye, Pumpernickel, and Cinnamon Raisin. Asiago Peppercorn, Ciabatta and Sourdough. Cranberry Walnut, Jalapeño Cheddar, Asiago Herb & Garlic, Marble Rye, Pumpernickel, Saffron, and Cinnamon Raisin. We offer specialty cakes by the slice each day at the bakery. Come in and see what we have to tempt your taste buds. Regular offerings include our famous scratch-made Carrot Cake, German Chocolate, Danish Layer Cake, Dutch Chocolate, Red Velvet and Almond Creme. *Please order your cakes 48 hours in advance to ensure we have adequate time to make them. Looking for a special treat? Try our Copper Country Whipping Cream Cakes and enjoy an almost lighter-than-air frosting! We offer a wide variety of flavors and frostings....pick your own special combination with our cake artists. Call and schedule a consultation or tasting today! Made from scratch and a perfect match for our homemade red velvet or carrot cake! An almost lighter-than-air treat that's packed with flavor...you have to try it to know just how good it is! A light, non-diary, whipped frosting. Available in vanilla or an amazing double-chocolate. Our homemade Danish pastry is the finest! The dough is a three-day process to prepare with numerous dough foldings and real butter applications. Offered with one of our 13 flavorful fillings in mini, individual Danishes or whole tea rings! Our Almond is Roy's Favorite! The croissant meets a Donut! We take croissant dough, shape it into a ring and fry it up like a donut. Get them glazed, halved with buttercream in the middle or with buttercream and raspberry filling. Spectacular! Assorted fry cakes and yeast raised donuts are made fresh daily. Our filled donuts and bismarks are not to be missed. Apple fritters, Persians and cinnamon twists round out our donut selections! Magic Bars, Grandma's Mistakes, Scotcharoos, Luscious Lemons, Strawberry Rhubarb or Date Crumble, Peanut Butter Swirls, Pecan Pie, Apple Cinnamon Squares, Peanut Butter Bars, and too many others to list! Stop in to see today's selection. A traditional pinwheel design just like Grandma used to make! Offered daily in Apricot, Prune and Raspberry. Other fruit varieties are offered by special order. A traditional Greek pastry made with thirty layers of phyllo dough. Each layer is buttered and filled with a mixture of walnuts, pecans, cinnamon and brown sugar nestled in dough that has a honey sugar glazing applied after it is baked. Our wonderful cookies are offered in many selections: M&M, Chocolate Chip, Molasses, Oatmeal Raisin, Plain or Decorated Sugar Cookies, Snickerdoodles, Peanut Butter, Cranberry Gems or Pumpkin with Raisin and Cream Cheese Icing. Try our Gluten-Free Chocolate Chip-It's a winner! We can make a specially decorated sugar cookie for your event! Just ask! Available in many varieties including Blueberry, Cranberry Orange, Lemon Poppy Seed, Apple Cinnamon, Strawberry Swirl, Chocolate, Chocolate Chocolate Chip, Chocolate Chip with Cherries, and Chocolate Cream Cheese to name a few. Stop in to see what we have baked today or special order your favorites for your event. Gluten-Free muffins are also available!